Beth is thrilled with the success of ParaNorman and the Suddenly Supernatural series. 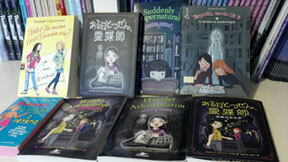 Her books continue to be translated into many languages, including French, German, Japanese, Italian, Turkish, and Indonesian! Beth's picture book about Gandhi's Salt March, entitled A Taste of Freedom, will be published next year by Bloomsbury. She is currently working on a new mystery, and a young adult novel. You can find her latest news on her Facebook page, "Elizabeth Cody Kimmel books".